Santa Clara, CA – International Test Conference – Business Wire - October 25, 2006 — Intellitech Corporation, www.intellitech.com, a leader in lowering product costs through IEEE 1149.1/JTAG has announced the availability of the SystemBIST™ evaluation thumb module. 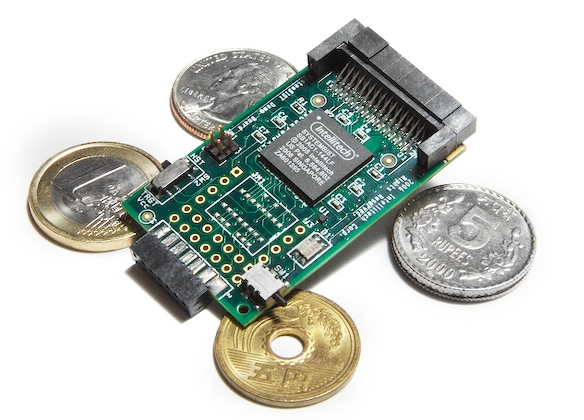 The thumb module contains Intellitech’s advanced FPGA configuration device called SystemBIST. The thumb module demonstrates for PCB designers and test engineers the ease of designing with SystemBIST as a central FPGA programming device for single and multi-PCB systems. SystemBIST enables multi-design, multi-FPGA configuration and is used as a substitute for using multiple platform Flash or proms for configuration of just a single design. While lowering the FPGA configuration cost, SystemBIST adds the ability to update CPLDs when needed and execute JTAG/IEEE 1149.1 tests at PCB power-up, without a personal computer or ATE. The device does not require any JTAG software to execute or to integrate with the system mission mode software. The thumb module also contains a 512Mbit Spansion flash device, pass and fail LED indicators, a 40Mhz oscillator and a JTAG interface. The memory supplied on the thumb module is oversized as using SystemBIST’s compression and data reuse, a full D size PCB with eight of the largest FPGAs would only require twenty percent of the memory for both FPGA and test data, allowing the remainder of the memory to be shared with processor boot code. The included software enables the user to create configuration and test scenarios and generate reports which indicate the amount of flash memory needed for a new design. Users can import JTAG tests from other boundary-scan tools or use the software to generate new tests. The thumb module is ideal for FPGA designers to show test engineers how to use the embedded JTAG capability as well as having test engineers show FPGA designers the added benefits of using a pre-engineered solution for FPGA configuration that can lower downstream costs in test and in-the-field updates. Intellitech's TEST-IPTM family provides patented infrastructure IP that enables customers to lower the cost of designing, debugging, producing and maintaining electronic systems. Intellitech's proprietary solutions enable customers to build self-testable and in-the-field re-configurable products with the least amount of engineering resources and at the lowest cost. Intellitech lowers production costs by embedding test or enabling concurrent test of electronic assemblies during production test and burn-in. The unified test and configuration approach enables customers to lower manufacturing test costs, provide field adaptable products and retard product obsolescence with field upgrade-able logic. The TEST-IP Intellectual Property is coupled with the Eclipse Scan-Based Diagnostic and Test tools to provide a powerful combination software-hardware tools for automatic test pattern generation, debug, and validation prior to embedding test and configuration data into the customer's product or passing to the PT100 production tester. Intellitech Corp. is focused on providing a complete customer solution early during the design phase that ensures success. The engineering and support team is dedicated only to providing a comprehensive low cost configuration and test strategy for the entire product. Over the years, the company has been successful in being the first-to-market and driving major technology changes in IEEE 1149.1 based configuration, debug and test. Intellitech’s PT100 Parallel Tester received the prestigious Test and Measurement World Editor’s Best-in-Test 2004 award. Intellitech's customer base ranges from companies providing the latest networking products to ATE companies providing cutting edge semiconductor testers, from semiconductor manufacturers to space related companies providing satellites to large computer companies delivering multi-processor systems. The company's broad product selection, strong support team, and compelling value proposition have resulted in solid profitability and a strong balance sheet. SystemBIST is a trademark of Intellitech Corp.